Stephanie is seventeen and when she ordered her purse, she stipulated that she didn't want too many beads because she doesn't like clutter. 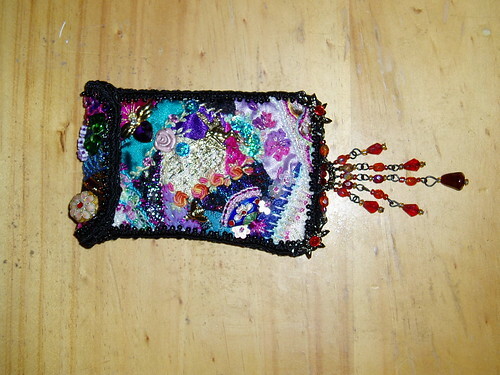 This is her purse which only had a beaded tassle instead of a fringe across the bottom (thank Heaven for those Indian/incense type shops for the linked plastic beaded necklaces)! Her favourite doo-dad was the ex-Avon lapel pin gold and purple Angel at the top right corner and her favourite piece of embroidery were the orange/yellow bullion roses.